I just tried and both posts work. Also the image pages are similar and match the regex to get the image URL. Maybe its just a temporary problem? Or is it persistent? Thanks very much for road testing these. I've waited a couple days and upon retrial am having the same issues so evidently there's a problem on my end. For my VEF activity I use an old laptop with old OS (XP SP2/3) and older version of FF, I wouldn't be surprised if something in that creaky combo is lousing things up. Has anyone here tried using IHG with Waterfox browser? Is so, how well does it compare to Pale Moon in regard to compatibility with IHG? IHG works perfectly with Waterfox on my system. Also I've noticed something strange in regards to IHG and imagebam. The first five requests get denied, but everything after downloads flawlessly for the rest of the day. If I go back to the first five I get those too. Very weird. I've got the same problem. 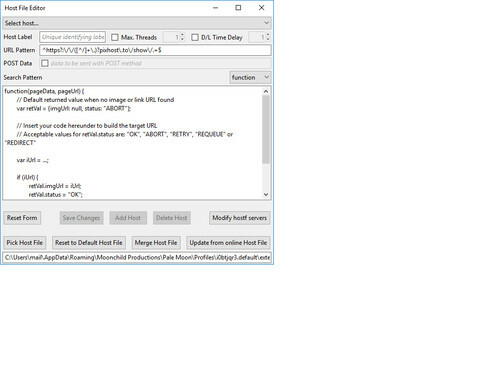 Seems any imagebam pics I try downloading with IHG return the "Request Aborted" error message. Can't figure it out. But what if some links still have the .org address? Isn't it safer to have the option to download both? 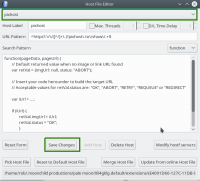 You can add pixhost.org and pixhost.to as 2 different hosts. That first one is what I currently have. It seems to be working fine. Last edited by beechcott; 06-08-2018 at 09:20 PM.. I'm having problems with IHG and any posts hosted by pixhost. into the host file editor's URL Pattern box and set the search pattern to "function"
The "Save changes" button is greyed out. What have I done wrong / omitted? Last edited by Hugh Jampton; 06-06-2018 at 10:13 AM..